Messianic Jews Are Not Antisemitic! One of the mini-controversies to erupt in the wake of the horrific Antisemitic murders in a Pittsburgh synagogue was a candidate inviting a Messianic Jewish leader to pray at a campaign event at which Vice-President Pence was present. Afterwards, both in the media and on social media, Messianic Jews were characterized as Antisemitic. Are Messianic Jews hateful of their fellow Jews? At the outset, I don’t want to comment on the wisdom of having a Messianic Jew pray at a political campaign event or even if such an invitation should be offered or accepted. That’s not my concern. The question is, are these public characterizations of Messianic Jews as Antisemitic fair or true? Some Gentile Christians are shocked that anyone would make an accusation of Antisemitism against Messianic Jews because Gentile Christians often don’t know or understand the history of Christian persecution of the Jewish people. That’s why Messianic Jews are vilified this way. Nevertheless, the history of the past does not make this charge true in the present. Here’s why it’s a mistake to call Jewish followers of Jesus Antisemitic. First, Jewish people who believe in Yeshua (Jesus) do so out of conviction not convenience. In the past, some Jewish people adopted Christianity to avoid the persecution that came with being Jewish. In some cases this provided protection from Antisemitic mobs while later on it offered opportunities to advance in society without the social stigma of being Jewish. But these are not motivations for contemporary Messianic Jews. Most of us, having grown up in Jewish homes, valued our culture and heritage. And by studying the Scriptures, we have become convinced that Yeshua is the fulfillment of the messianic hope of the Hebrew Bible. Our faith is the sincere outworking of the promises God made to Israel. We are convinced that Yeshua is the Jewish Messiah and our faith in Him does not eliminate our identification with the Jewish people. In fact it enhances it. Second, Jewish people who believe in Yeshua identify with the love of Yeshua not the past hate of so-called Christians. While many Christians today are unaware of this history of Christian Antisemitism, most Jewish people are equally unaware of Yeshua’s love and concern for the Jewish people. As Yeshua taught in the synagogues of Galilee, He looked at the crowds of Jewish people around Him, “and He felt compassion for them, because they were weary and worn out like sheep without a shepherd” (Matt 9:35-36). In the very next chapter of Matthew, when Yeshua sent out His disciples, He instructed them to “go to the lost sheep of the house of Israel” (Matt 10:6). It wasn’t only the impoverished Jewish masses that Yeshua loved. When he met an affluent leader of the Jewish people, Yeshua looked at him and “loved him” (Mark 10:21). Yeshua even loved the Jewish leadership that opposed Him. He wept over Jerusalem (Luke 19:41) and said, “How often I wanted to gather your children together, the way a hen gathers her chicks under her wings” (Matt 23:37). Yeshua loves the Jewish people in a special way and so do His Jewish followers who identify with Him as their Messiah. Third, Jewish people who believe in Yeshua stand in solidarity with the Jewish community not with the vile haters of the Jewish people. Messianic Jews have always been subject to Antisemitism not proponents of it. When the Emperor Claudius expelled all the Jewish people of Rome, Jewish followers of Yeshua, like Priscilla and Aquila, were expelled with the rest of the Jewish community (Acts 18:1-2). In the modern era, Jewish followers of Yeshua in Germany and Eastern Europe went to Hitler’s ghettos, concentration camps, and gas chambers as did the rest of the Jewish people there. Messianic Jews not only suffer with the Jewish community but they also boldly oppose Antisemitism. Jewish followers of Yeshua are some of the most outspoken supporters of the state of Israel, defending it against the legion of haters that attack it. And when there is a terrorist attack there or one in a Pittsburgh synagogue, Messianic Jews weep and are just as brokenhearted as the rest of the Jewish community. It is mistaken and false to label Messianic Jews as Antisemitic. In their desire to be sensitive, Gentile Christians should not be taken in by these charges. C.S. Lewis had a special insight into what it meant for a Jew to believe in Yeshua because he married such a Jew, Joy Davidman Gresham. Lewis said the Jewish follower of Yeshua “is the only normal human being in the world. To him, in the first instance, the promises were made, and he has availed himself of them. He calls Abraham his father by hereditary right as well as by divine courtesy. He has taken the whole syllabus in order, as it was set; eaten the dinner according to the menu. Everyone else is, from one point of view, a special case, dealt with under emergency regulations … we christened gentiles, are after all the graft, the wild vine, possessing ‘joys not promised to our birth’; though perhaps we do not think of this so often as we might.” It would be a good idea for traditional Jews and Christians to adopt this perspective. I am still a Jew but now a completed Jew and when any Jew is attacked by an Anti-Semite us Messianic Jews are in pain too. We must stand together. Thank you, Dr. My heart is with the Jewish people. I am so grateful for your ministry and knowlege. Thank you for being willing to share your faith and studied response to those who do not understand Yeshua as the promised Messiah. God bless and keep you and yours. 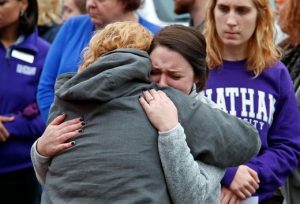 Excellent commentary with some really great points that only a Messianic Jew could see the need to open up for the Christian community following the many things being said after the Pittsburgh synagogue attack. Thank Dr Rydelnik. Your viewpoint is clear and encouraging. I always enjoy your blog. God bless you! Michael, in making biblical arguments with sensitivity to a proper relationship between Jews and Christians, you are extraordinary. This presentation is economical and penetrating in expression, and embodies a sensitivity few can match. Bravo.